So it has begun. 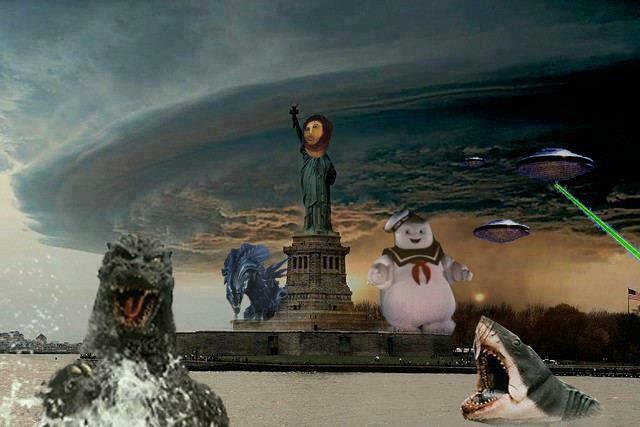 Hurricane Sandy is only one day in to its battering of the East and the religious have weighed in. I will warn you – it’s not good. I was introduced to this photo by a worker at our facility today (who listens religiously to the Howard Stern show) and I was immediately suspicious of both the sunshine in the foreground and the speed boat that looks oddly mis-sized. I thought it humorous until that afternoon when I logged onto Facebook and notices that it had already been shared by hundreds of people. What really caught my attention, though, was a response in the form of a prayer. I was stunned. There are so many elements of this ‘prayer’ that concern me. I was filled with questions. Perhaps the biggest one was : Is there a god who hears these kind of prayers? This past Sunday at the Loft LA I had preached a sermon called ‘Why Pray?’ about this exact type of thing … so my attention was immediately piqued. On a side note – I especially appreciated that just hours later this fake meme showed up in the twitter-verse. I am deeply concerned about people who think that their prayers can command whole weather patterns. This concern is primarily at two levels. The first is that I know so many of them. The second is that a wooden reading of the Bible can lead one to think that this is acceptable and permissible. As funny as that last comment may be, I am not amused – because it concedes the rules of the game to the antiquated notions of centuries past and abdicates the metaphysical realities of 21st century life to the … let’s just say – the conceptions of bygone eras. The picture was a fake. I questions the ‘god’ who they were offered to. I am flusted that in the midst of suffering, those who claim Christ offer blame and not compassion. They justify that stance by saying ‘if you only did what we said was right’. It signals a pattern of christian response to tragedy. I am concerned that the fakeness of the pictures and posts we respond to correspond to our notion of reality and our conception of how the world works … and thus how our prayers are effective.